The Villa of the Papyri is the name given to a private house that was uncovered in the ancient Roman city of Herculaneum. This city, along with nearby Pompeii, is perhaps best remembered for its destruction during the eruption of Mount Vesuvius in 79 AD. Because of this natural disaster, the buildings of these cities were preserved under a thick layer of volcanic ash. One of these buildings was the Villa of the Papyri, named as such due to the discovery of a library in the house that contained about 1800 scrolls of papyri (known today as the ‘Herculaneum Papyri’), which were carbonized due to the eruption of Mount Vesuvius. Researchers believe the Villa of the Papyri belonged to Lucius Calpurnius Piso Caesoninus, Julius Caesar’s father-in-law. This villa is located in the northwestern part of Herculaneum, on a slope of the volcano overlooking the Bay of Naples. Built in terraces down to the sea, the villa was a grand structure, covering an area of 30,000 square feet (2787 sq. meters). The front of the villa stretched for more than 820 ft. (250 meters), and offered its inhabitants an unobstructed view of the bay. The villa included two peristyles, a swimming pool, gardens, living and reception quarters. The Getty Villa in Pacific Palisades, Los Angeles. 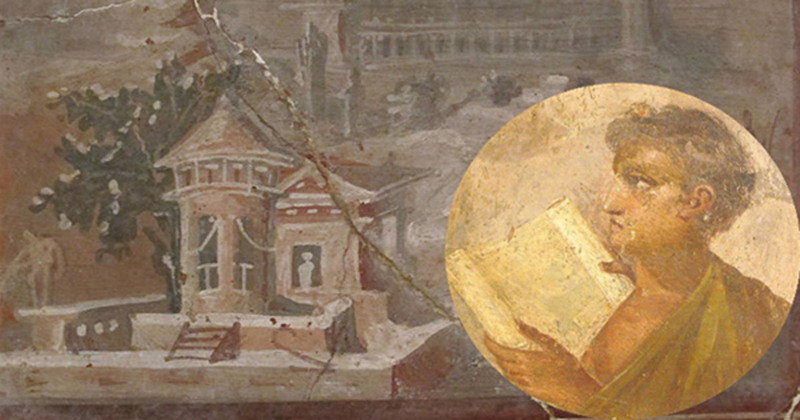 ( CC BY SA 3.0 ) The villa’s design was inspired by the Villa of the Papyri at Herculaneum. It was only during the 18th century that the villa was rediscovered. In 1709, the city of Herculaneum was rediscovered when workmen digging a well in the town of Resina stumbled upon the upper level of the ancient town’s theatre. Excavations began to be carried out and were funded by the House of Bourbon. In 1750, the Villa of the Papyri was uncovered, and an excavation was soon undertaken under the direction of Karl Weber, a Swiss architect and engineer. Two years later, in October 1752, the villa’s library was discovered, and with it, the first cache of papyri was brought to light. Containing about 1800 scrolls, the collection of this library is relatively small. Yet, it is the only known library to have survived from the Classical world. Hence, the library has a great importance in the eyes of both archaeologists and classicists. Exposure to the volcanic gas and ash meant the scrolls were carbonized – they were turned into charred cylindrical lumps. In fact, the papyri were initially mistaken for lumps of charcoal or burnt logs, and their value was only recognized later. The carbonization of the scrolls effectively preserved them, though at the same time, it made them extremely difficult to unroll. Attempts have been made to read the contents of these scrolls. Some were unceremoniously hacked open with a butcher’s knife, whilst others were simply unrolled. Needless to say, damage was done to the fragile artifacts. An ‘unrolling device’ was even invented by Antonio Piaggio, a Piarist monk, specifically for the unravelling of these papyri. Though the scrolls were unrolled with this device, they remained fragile, and the process took a very long time. The first scroll took four years to unravel. Nevertheless, progress was being made, and by 1790, reports on the contents of the library were being published. Over the next two centuries, various techniques have been developed in the hope that the contents of the papyri may be accessed. Some of the most recent attempts involve digital, rather than physical, unravelling of the scrolls. In order to do so, methods such as X-rays, digital photography, and microscopy have been utilized. However, it is still very difficult to view the writings on the papyri. The main problem is that the ink and the papyri are physically similar, as the Romans used a carbon-based ink made from smoke residues. In other words, it is not easy to differentiate the writings from the carbonized papyri.